Brogo’s Nathan Johnston, founder of DME3. Photo: DME3 Facebook. A Brogo man whose wheelchair inspires his creativity rather than hinders it has launched a new music platform to rival Apple and Spotify. Twenty-four-year-old Nathan Johnston is busting about the potential DME3 offers musicians, music fans and himself. The first phase of DME3 went live just before Christmas, the culmination of years of vision and work. Bit by bit, a catalogue of music is building ready for fans to enjoy. “It is free for musicians to submit music to the platform and they will get exposure not only locally but worldwide,” Nathan says. Right now Nathan, who went to high school in Bega, is keen to hear from musicians who want to share their music, build an audience, and potentially, in the long run, receive fair and honest payment for their talent. One of the strengths of the DME3 platform is its accessibility. “Everyone including those with disabilities can use the website. That means our platform can be read by reading programs such as Read & Write Gold, ClaroRead Software and others,” Nathan says. Nathan, who is a digital musician himself, was born with cerebral palsy, and writing songs on his laptop has become central to his life. This new venture realises his long-held dream of creating an opportunity for all. “This is about building a fairer playing field for artists and creating future employment for myself,” Nathan says over a hot chocolate. “The other music platforms don’t pay artists fairly, eventually DME3 will change that. Over the last four years, Nathan has met significant funding, legal, marketing, and IT challenges with a level of patience only matched by his passion and commitment. The support of family, friends and longtime support worker Ross Cameron has been key. 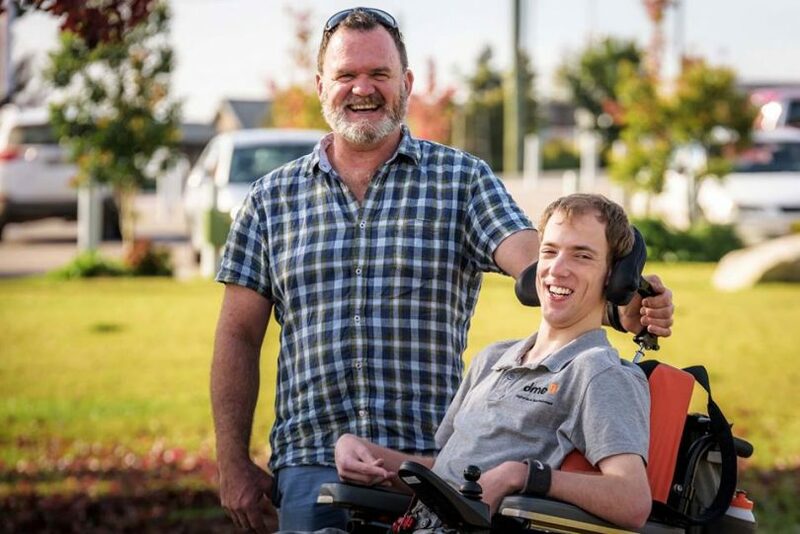 Nathan and his right-hand man, Disability Support Worker – Ross Cameron. Photo: DME3 Facebook. Financial support from Clubs NSW, Uniting, My Choice Matters and $7,500 in donations from the local community have got DME3 to this point. Nathan says this first stage could not have been achieved without Canberra-based web design service Future Theory and the legal team at Sneddon, Hall and Gallop. “I am having trouble coming to terms that this is finally a reality and now I am working even harder to get artists on board,” Nathan says. Aside for Nathan’s own music, four other artists have already signed up including, Barrun/Runes, a metal and all-genre band from Wisconsin in the USA, the Pambula Beach Garage Band, the Bega-Valley-based Jeniva Convention, and Sydney pop/rock and modern country outfit Craig Woodward & The Lonely Dogs. Nathan is especially hoping that DME3 will support artists living with a disability. 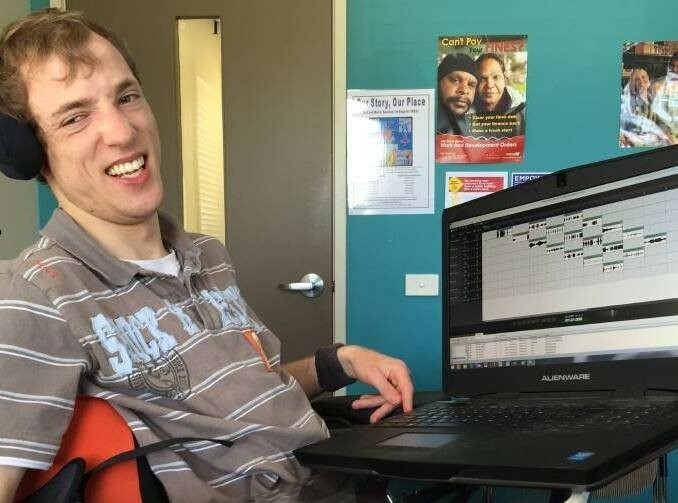 “We have been discovered by an American music disability network called Can Do Musos and I am hoping they might be able to promote DME3 to their members,” Nathan says. “If their musicians come on board it will be a big step in launching our streaming service for listeners. “I want to be able to provide a big selection of music and for that to happen we need lots of music. Nathan hopes to launch the music streaming service later this year but in the meantime is keen to hear from artists with or without a disability from around the world. Find out more and make contact via the DME3 website.